What Is the Best Clam Chowder? After considerable research on hundreds of soups, we narrowed it down to our top pick-Progresso Soup, Rich and Hearty New England Clam Chowder Soup, Gluten-Free 18.5-oz. can. We chose this hearty soup because of its rich, creamy texture and impressive quality. Made with real ingredients, Progresso’s New England clam chowder is ready to serve in under 5 minutes, a great choice if meal-prep time is short or you just don’t feel like cooking. In many cases, some of the original flavor of food is lost during the canning process, but this product delivers as promised. Many customers were impressed with how flavorful it is, considering that it comes in a can. While most products of this quality come with a substantial price tag, our No. 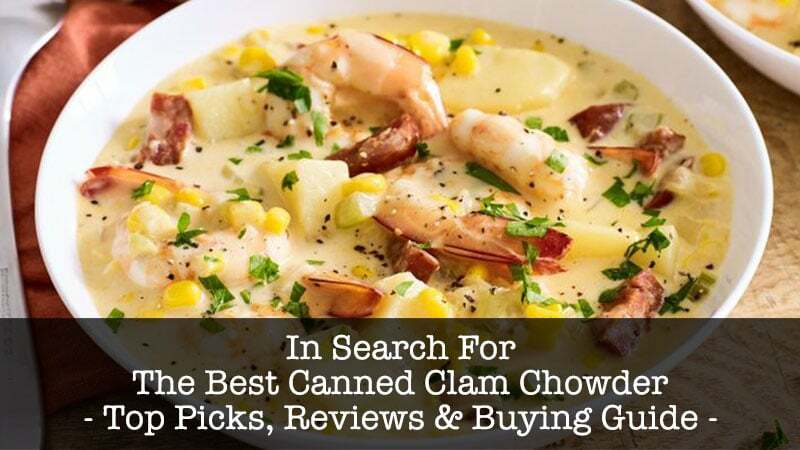 1 pick for best all-around canned clam chowder won’t send your grocery bill through the roof. Traditional clam chowder is known for its hearty consistency and rich flavor. If you live in the Northeastern region of the US, near the coast, you can enjoy fresh clam chowder at most restaurants without giving it much thought. Most of us don’t have that luxury. 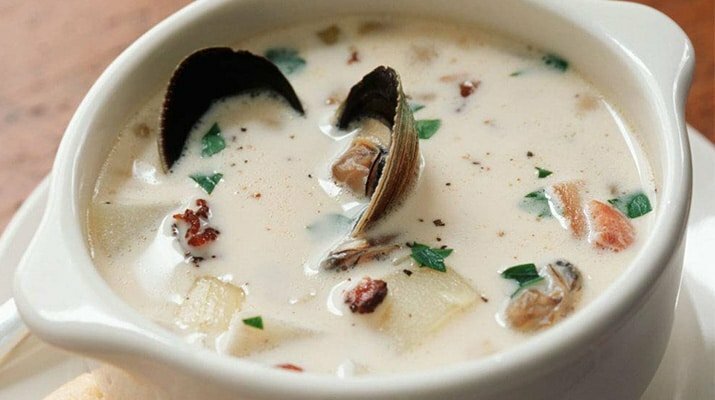 Although it’s possible to make clam chowder at home, most people are just not up to this complicated task. Therefore, the most practical option is to purchase the canned variety, which you probably wouldn’t expect to taste as authentic as freshly-prepared soup. Surprisingly, though, with the best canned clam chowder, you can enjoy most of the benefits of the freshly-prepared variety. Clam chowder is a great source of comfort food on a cold night or as a quick, nutritious snack. Here are some factors to consider as you compare brands and prices on your quest for the best canned clam chowder. How much sodium do the soups contain? Most canned products-and most processed foods in general– contain considerable amounts of sodium. This is a concern for many, especially those with heart disease, diabetes, and other chronic conditions. Instant canned soups are sometimes quite salty. The disadvantage of these is that, while adding water will dilute the sodium, it may take away from the overall flavor. If you prefer an instant clam chowder, check the label-low sodium options are available. Another option is to choose from among the concentrated clam chowders. In their original canned form, they have a salty taste. But they’re made for ease-of-preparation, allowing you to add water, milk, or cream, and usually butter, to achieve the consistency and flavor you want. The more liquid you add, the less you will notice a salty taste. Sometimes it is used in canned foods to mask the taste of lower-quality ingredients. Soups with a lesser percentage of salt are more likely to contain better ingredients. Read labels and do your due diligence in researching a product before you buy. The best canned clam chowder provides a healthy balance of vegetables and protein. 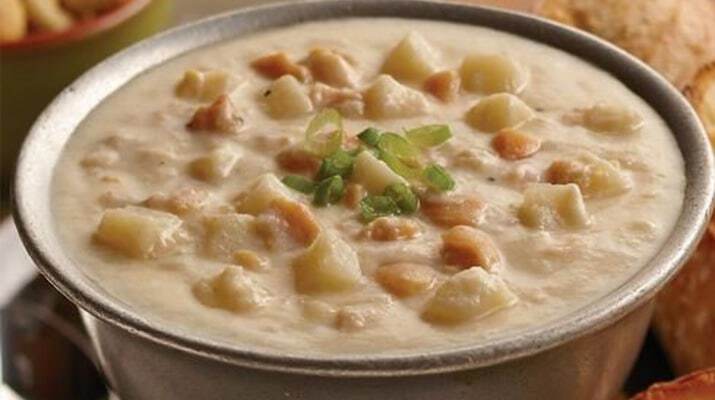 It’s not uncommon for some companies to offer clam chowder-which consists mostly of clam and potatoes-as a soup that’s much more potato than clam. What you have in that case is a higher percentage of starch. A quality chowder should contain an ample stock of whole clam pieces, rather than mostly clam flavoring and a few wisps of shredded clam, with potatoes as a filler. Depending on where you live, canned clam chowder may not always be readily available. 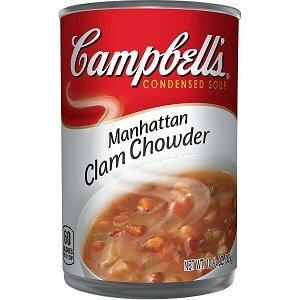 Some of the best canned clam chowder cannot be found in many on-ground grocery stores and must be ordered online. This requires a little more advance planning, but it’s worth it when you can enjoy a high-quality chowder. Also, think about how much time you want to spend preparing your chowder. Do you prefer it as a meal or a quick snack? Do you plan to enjoy it at home or on a camping trip? If you’re taking it on the go, a simple soup that you can just open and warm up is probably your best bet, since adding milk or cream may not be possible when you’re sitting around a campfire. If you’re eating at home and don’t mind spending a few extra minutes in the kitchen, selecting a soup that allows you to add to it may be just what you need to hit the spot. With the increasing prevalence of slow cookers, instant pots, and other handy cooking appliances, people are beginning to broaden their horizons, preparing elaborate dishes at home that used to only be available in restaurants and cafes. Clam chowder, however, can be difficult to concoct within the confines of a home kitchen. Achieving the right milk base is an art form that can prove challenging even to seasoned home cooks. Too often, the milk curdles before reaching the desired consistency. Additionally, if you live in an area where quality seafood is not readily available, you may be less-than-satisfied with the results if you attempt to make chowder with subpar ingredients. Plus, for many of us, it’s just difficult to find the time that multi-step home-cooking projects require. You may be surprised to learn that not all clam chowder is made in Maine or New England, areas that are famous for delicious seafood. At least one product we reviewed, for instance, is made in Oregon. Since it’s based on the coast, it’s still able to deliver the high-quality wild-caught clams that make for an excellent chowder. What Are the Varieties of Canned Clam Chowder? While most of us are familiar with the classic New England clam chowder, other varieties of the hearty soup are available, too. In our extensive search, we also looked at Manhattan, New Jersey, and Minorcan chowders. While most have a creamy base, sometimes with tomatoes added, you can also find clear chowder, though it’s less common. Clear chowder, which comes from Rhode Island, is made with clam juice. Here’s a breakdown of what sets one type apart from another. New England chowder is the kind that most readily comes to mind when we think about this creamy, seafood soup. It has a thick cream or milk base, usually with an ample supply of potatoes and onions added. These are usually the only vegetables you will find in this kind of chowder. Most chefs throw in a bit of pork or bacon to give it a hint of salty flavor, but not enough to detract from the rich taste of the clams. This wholesome soup makes an excellent comfort food. Manhattan chowder is easy to recognize because of its red color, which is achieved by adding tomatoes and tomato puree. Manhattan chowder has a thinner base than traditional New England chowder, with a few potatoes thrown in. Another distinction that sets Manhattan chowder apart from its New England cousin: the New York chowder contains more vegetable varieties, such as celery, onions, garlic, and carrots. 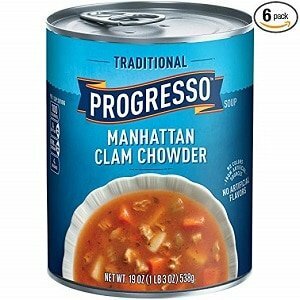 You can find Manhattan clam chowder not only in New York, but in most major cities throughout the US. New Jersey clam chowder is similar to the Manhattan kind, with a bit of a twist. Order a bowl of New Jersey chowder and you will find it contains bacon, light cream, tomatoes, and creamed asparagus. Perhaps less well-known than the others, Minorcan chowder actually traces its origins to Florida. When former residents of the Spanish Island of Minorca settled in the Sunshine State, they brought their culinary traditions with them and are credited with inventing this chowder. It is flavored with a datil pepper, a Mediterranean ingredient that gives the soup a sweet, tart, spicy flavor. Otherwise, the soup has much in common with Manhattan chowder. New England vs. Manhattan Clam Chowder: Which Should You Buy? New England and Manhattan clam chowder are the two most common types you will find when shopping for this cream-and-clam soup. The New England variety has a milk or cream base with the classic white or off-white color. The primary components of this soup are usually potatoes and onions, with perhaps a little bacon or pork to give it a salty taste. Manhattan clam chowder has a thinner base and a red color because tomatoes have been added. Historically, many New Englanders considered this version a slight to their native soup. Think we’re joking? Believe it or not, Maine actually passed legislation in the 1930s outlawing the addition of tomatoes to chowder. For a long time, the Manhattan mixture wasn’t even referred to by name, although it has since gained popularity in many places. On a more serious note, Manhattan chowder probably evolved because of the influence of Italian and Portuguese cooking traditions that made their way to New York and New England fishing villages decades ago. When it comes to Manhattan clam chowder, its history is as rich as its flavor. Which chowder you buy will depend largely on your preferences. If you like thick, creamy soups with just the basic ingredients, New England clam chowder will probably be the best fit for your tastes. If, on the other hand, you prefer a thinner soup with lots of different vegetables, you might like Manhattan chowder better. When it was first created, this New York-based soup was not popular, but in time, it caught on, and many people like it because of its tomato base and greater variety of vegetables. To decide which was the best canned clam chowder, we looked at hundreds of different products, especially their ingredients, and how much value buyers would get for the price of the chowder. The best soups are made of natural (or mostly natural) ingredients, with few, if any, preservatives. We also read scores of reviews from customers, who included chowder connoisseurs as well as people just looking for a good seafood snack. We weighed the pros and cons of each brand and type of soup. Finally, we arrived at our decision. Below, we’ll give you the scoop on the 7 best canned clam chowders. What You Will Love: This claim chowder is rich and hearty and contains no artificial ingredients. Large cans ensure you won’t get stuck with undersized portions. Coming in at first place for best canned clam chowder all around is Progresso Soup, Rich and Hearty, New England Clam Chowder Soup, Gluten-Free, 18.5-oz. Can. It’s rich and creamy, with a classic taste that isn’t compromised by the canning process. Loaded with potatoes and clams, it contains no artificial flavors and is gluten-free. Preparation is simple. You don’t have to add any water. Just pop open a can, warm it up on the stovetop or in the microwave, and it’s ready to serve in under 5 minutes. You get 2 servings per can. Fresh seafood can get a little pricey, but you won’t have to shell out much cash for this wholesome soup. It’s rich and creamy and is packed with flavor. Large cans give you a little extra soup to enjoy. It doesn’t contain any artificial colors or flavors. The price is very reasonable, too. Customers appreciate that the soup comes in a pop-top can, so there is no need to deal with clumsy can openers. Couldn’t find many. There were a few complaints that there is more clam flavoring in this product than actual clams. If you’re looking for a quality clam chowder that can be prepared in minutes, we encourage you to try this out. 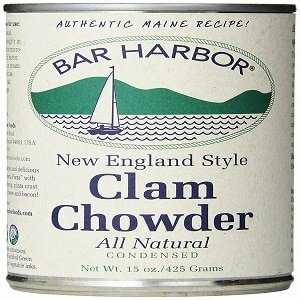 What You Will Love: This best canned clam chowder on a budget comes with great flavor, natural ingredients, and a price tag that won’t break the bank.If you’re wondering whether it’s possible to enjoy good clam chowder on a budget, we have good news: you can-with Bar Harbor Chowder, New England Clam, 15-oz. Pack of 6. 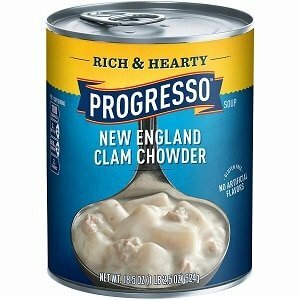 This New England clam chowder delivers restaurant quality– in a can and at a modest price. Sourced with clams from Maine, it contains natural ingredients (fresh clams, potatoes, water, wheat flour, onions, salt, and spices). Even better, it’s made in small batches, so it doesn’t have that mass-produced, bland, generic taste that characterizes some foods produced in bulk. Preparing it is easy too. Just heat to boiling on the stove, add a small amount of butter and cream or milk, and perhaps a little salt and pepper or garnish or you can enjoy it as-is. You can enjoy natural ingredients and authentic flavor. The price is less than what you might expect for a product containing seafood. Customers said it tastes homemade, and that it’s great comfort food for a cold, winter night. Some customers complained that there aren’t enough chunks of lobster in each can. Also, it will taste really salty if you don’t add the cream or milk, as suggested on the label. Straight out of the can, it’s concentrated clam chowder, so it won’t have the right flavor unless you use the product as directed. This is a good choice for those who want a homemade-tasting soup without shelling out a lot of cash. This is especially ideal for people who like to “doctor up” prepared food by adding their own ingredients to make it all their own. What You Will Love: This best canned clam chowder from Manhattan contains a delicious blend of pureed tomatoes, clam broth, carrots, potatoes, and of course, clams. If you want clam chowder that’s a little different than the New England variety, we recommend Campbell’s Condensed Manhattan Clam Chowder 10.75-oz. Can (Pack of 12). Cans contain a delicious blend of tomato puree with farm-raised carrots, celery, and tender clams, cooked to perfection. Traditionally-flavored, it’s low in fat and cholesterol and contains no artificial flavors. Perhaps the best part for many customers: the cans are recyclable, with a BPA-free lining. To enjoy a bowl of steaming seafood goodness, all you have to do is combine the condensed soup with a can of water, warm it up on the stovetop or in the microwave, throw in some crackers if you like, and serve. This chunky soup offers excellent flavor without requiring you to pay high-end restaurant prices. The chowder is easy to prepare, too. If you’re looking out for the environment, you’ll be happy to know that the cans are recyclable. And if you have concerns about synthetics, it’s good to know that the cans have a BPA-free lining. Because the soup is concentrated, you can add as much (or as little) water as you want to achieve the thickness you like. We highly recommend this soup for anyone who wants a little different take on the traditional chowder. What You Will Love: If you don’t like wrestling with a can opener, we have good news: this homestyle clam chowder comes in pop-top cans. The soup makes an excellent meal choice if you don’t have a lot of time for food-prep. Just warm it up on the stove or in the microwave, and serve. You don’t even need to add water. 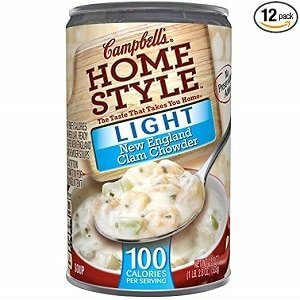 Campbell’s Homestyle Light New England Clam Chowder, 18.8-oz (Pack of 12) was our favorite pick for authentic chowder from the Eastern seaboard. Loaded with high-quality clams and lots of fresh vegetables, this superior product lets you enjoy plenty of classic flavor, without all the calories that usually go along with anything that tastes great. Unlike many canned soups, this one contains no preservatives. Excellent flavor, with a low calorie count and no preservatives. Quick prep time makes this hearty homestyle soup a great meal or snack. We couldn’t find many, as the majority of customers gave it four or five stars. There were some comments about the high sodium content, a characteristic of many canned soups. This hearty soup is for anyone looking for a quality clam chowder that doesn’t have all the calories that many other cream soups do. What You Will Love: If you have dietary concerns and are looking for the best canned clam chowder that is also gluten-free, we may have found just what you’re looking for: Progresso Soup, Traditional Manhattan Clam Chowder Soup, Gluten-Free, 19-oz. Cans (Pack of 6). Packed with classic flavor, this gluten-free, wholesome Manhattan clam chowder is made with carrots, potatoes, celery, and of course, clams. There are no artificial flavors or colors that come from artificial sources. Each can contains 2 hearty servings. Prepping the soup is hassle-free. Just pour the contents of the can into a saucepan or microwave-safe container, warm them up, and serve. Pop-top cans make for easy opening. This soup is gluten-free and has plenty of flavor. Large cans allow for ample portion sizes. We couldn’t find many. As is the case with any product, you will always have a few customers who are not satisfied. While that was the case here, there were no consistent complaints about any specific issue. This canned clam chowder is good for anyone who is sensitive to gluten or is just looking for healthier food options. What You Will Love: The best clam chowder in condensed form offers a variety of wholesome ingredients and gives you the flexibility to add cream, milk, and/or butter to achieve the thickness you want. One advantage of condensed clam chowders is that they provide a base to which you can add as much (or as little) milk, cream, or water as you want to achieve the desired consistency. When it comes to the best canned clam chowder in condensed form, we gave the gold medal to Chincoteague Seafood New England Clam Chowder (15-oz cans, pack of 12). With no preservatives, no artificial colors or flavors, and no MSG, this authentic taste of New England contains lots of hearty ingredients, such as potatoes, celery, onions, spices, and of course, clams. This product also gives you the flexibility to add whatever you want to customize it. Customers recommend adding butter or cream, and perhaps a bit of seasoning if you want something a little spicier. Customers mostly only had good things to say about this soup. They liked that it’s condensed and you can add to it according to your preferences. They also appreciated the flavor and hearty consistency, especially the wholesome clam chunks. We really couldn’t find many. Even with so many satisfied customers, there are always a few outliers. A handful of buyers complained that the soup is bland. There were also comments about receiving dented cans. This chowder is recommended for anyone who wants to get a little creative with their chowder-prep. What You Will Love: This wholesome soup offers a healthy alternative to canned foods that are filled with additives and GMOs. It’s packed with nutrients and great flavor. Last but not least, we want to give you our recommendation for the best canned classic clam chowder. 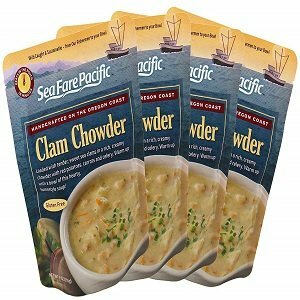 That distinction goes to Sea Fare Pacific Clam Chowder – Classic (4 Pack). This soup contains wild-caught clams for authentic flavor, and is packed with healthy Omega-3 fatty acids. Ingredients are all-natural, so it can be an especially good choice for people with food allergies or those who are just looking for something that doesn’t contain GMOs and harmful additives. Preparation is simple and straightforward– just warm up the chowder on the stove or in the microwave, serve, and enjoy. Loaded with wild-caught clams and all-natural ingredients, this hearty clam chowder is packed with nutrients and tastes great. We couldn’t find many, as most customers gave stellar reviews about this soup. Besides a few complaints about a bland taste, the drawback people most frequently cited is the price. 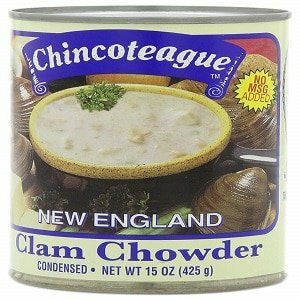 This is for anyone looking for an especially healthy, traditional clam chowder in a can.